Samsung has released their Galaxy M series in India, both Galaxy M10 and M20 were officially launched in India yesterday. These smartphones were made especially for millennials and were marketed by the South Korean company as an “India-First” smartphones. Both M10 and M20 feature infinity-V displays with dual rear cameras, face lock, and 5000 mAh battery. The South Korean company has not yet provided its One UI based on Android Pie on the newer phone models. But, a newer custom skin will be seen, this will be powered by Android 8.1 Oreo on the New M series of their phones. The phones will also have Widevine L1, this will enable HD video streaming apps like Netflix and Amazon Prime Video. Both phones will be available on February 5 in Samsung India e-store and Amazon India. 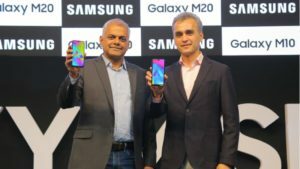 The Samsung Galaxy M20 will start at Rs. 10,990 for its 3GB RAM/ 32GB internal storage variant, while the 4GB RAM/ 64GB storage variant will be available for Rs. 12990. 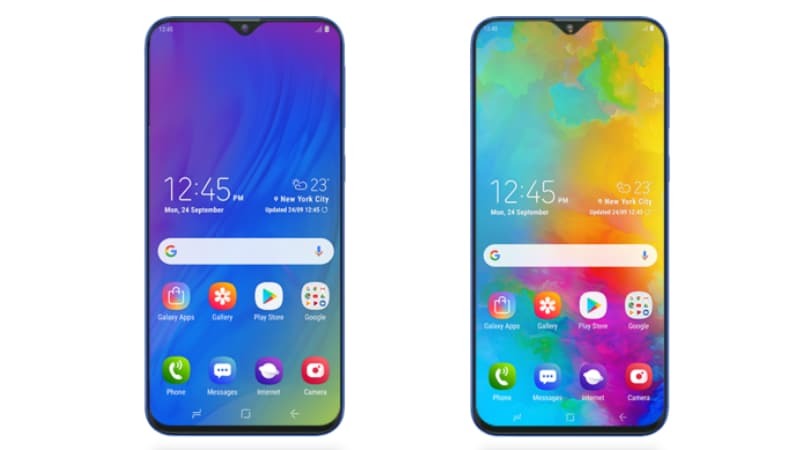 The Samsung Galaxy M10 will start at Rs. 7990 for its 2GB RAM/ 16GB internal storage variant, while the 2GB RAM/ 16GB internal storage variant will be available for Rs. 8990. The M-Series will be available in Amazon.in and Samsung India e-Store on February 5. There will be 2 colors available for the phones, which are Ocean Blue and Charcoal Black. Reliance Jio 4G is giving an Double Data offer if you buy the Galaxy M-Series, you will get double data on Rs. 299 and Rs. 198 recharge packs. 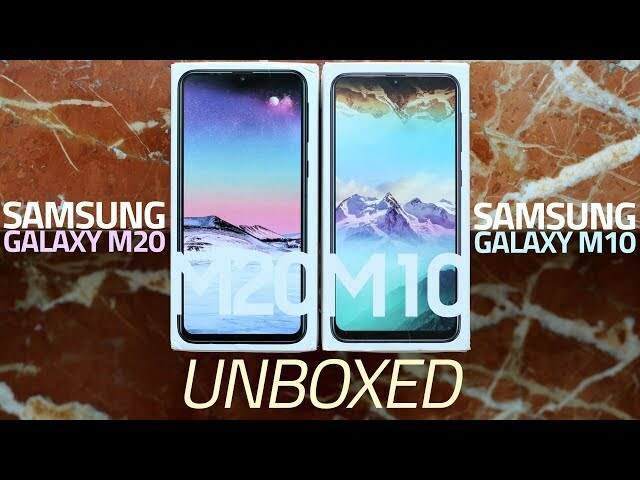 The Samsung Galaxy M20 is a Dual SIM phone that runs on Android Oreo 8.1 that is based on Samsung Experience 9.5 UX. Its display is a 6.3-inch Full-HD+ 1080×2340 pixels Infinity-V Display with the aspect ratio of 19.5:9. The M-Series is powered by the Exynos 7904 SoC, two variants are available, with 4GB Ram or 3GB Ram and a Mali-G71 MP2 GPU. Both phones will feature a dual rear camera with a 13-MP primary sensor, sporting an f/1.9 aperture and a 5-megapixel ultra-wide sensor. For the front camera, an 8MP sensor will be available with an f/2.0 aperture. The M20 will have 2 variants, one with 32GB internal storage and one with 64GB internal storage, you can expand its storage up to 512GB by using a microSD card. A fingerprint sensor is also available in the back of the phone, and a face unlock is also available. The M20 has a batter capacity of 5,000mAh that supports fast charging by using a USB Type-C. The Samsung Galaxy M10 is a Dual SIM phone that runs on Android Oreo 8.1 that is based on Samsung Experience 9.5 UX. Its display is a 6.3-inch Full-HD+ 720×1520 pixels Infinity-V Display with the aspect ratio of 19:9. The M-Series is powered by the Exynos 7870 SoC, two variants are available, with 2GB Ram or 3GB Ram and a Mali-G71 MP2 GPU. Both variants will feature a dual rear camera with a 13-MP primary sensor, sporting an f/1.9 aperture and a 5-megapixel ultra-wide sensor. For the front camera, an 5MP sensor will be available with an f/2.0 aperture. The M10 will have 2 variants, one with 16GB internal storage and one with 32GB internal storage, you can expand its storage up to 512GB by using a microSD card. The M10 comes with a micro USB port. The phones battery capacity is 3,400mAh.